The Federal Reserve’s Senior Loan Officer Opinion Survey on Bank Lending Practices came out and the news was more of the same. Their survey covers senior loan officers at about 60 domestic and two dozen foreign banks with US branches. Banks’ residential real estate lending standards reportedly remained about unchanged over the past three months. As in each of the previous three surveys this year, respondents reported little change in their standards for prime mortgages. In the October survey, standards on nontraditional mortgages were reportedly unchanged, in contrast to the tightening reported earlier in the year. 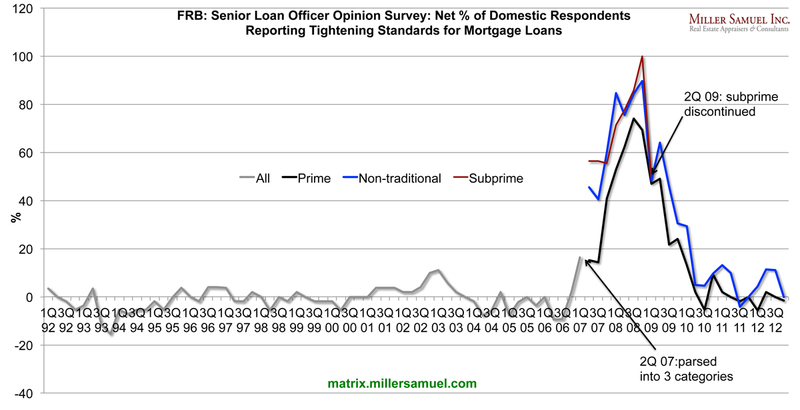 Respondents continued to report that demand for residential mortgage loans had increased over the past three months on net, although the fractions of banks that reported an increase in demand for both prime and nontraditional residential mortgage loans declined from their levels in the July survey. Standards and demand for home equity lines of credit were reportedly about unchanged. People are confusing rising demand with easing standards.